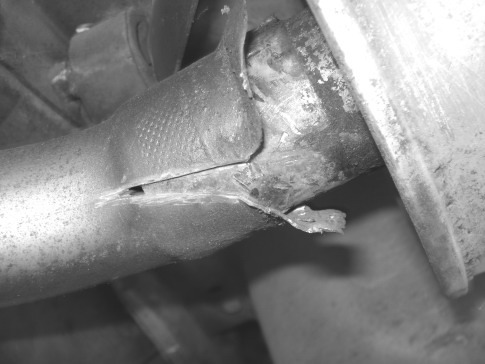 Usually, as I have learned from experience, if one part of the exhaust system fails, its best to replace the whole exhaust system from the catalytic converter back (excluding the catalytic converter). There are exceptions, of course, as when a pipe fails between two lifetime warranty mufflers. Volvo offers limited lifetime warranty mufflers (but no warranty on the axle pipe or tail pipe). The mufflers are, I believe, aluminized steel and are much more corrosion resistant than normal mufflers. I have had good luck with these mufflers, with some lasting 10 years and more (albeit, the car has low mileage on them). And when one has failed, I have had no problem getting a free replacement from the local Volvo dealer. Installing an exhaust system is simple. Its the removal of the old exhaust system thats problematic. Removal is a time consuming and oft-times frustrating affair, as most of us dont have a cutting torch like the professionals have. But, I have some hints to help make the job go a bit faster and more smoothly. Remember to have patience during the dismantling process. 1) Safety First! Find a level surface. The best way to work under the car is to drive the rear wheels up good ramps. (Mine are rated at 12,000 lbs. gross vehicle weight.) Next, set the transmission in Park (automatic) or in 1st gear (manual), pull up the handbrake, and chock both front wheels. I recommend ramps over jackstands. 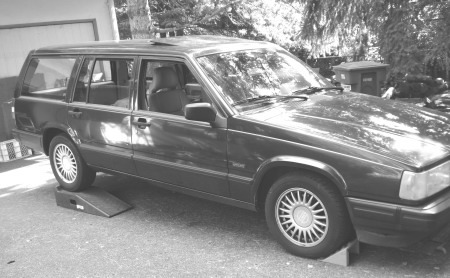 2) But, if you dont have ramps, use good jackstands. First, set the transmission in Park (automatic) or in 1st gear (manual), pull up the handbrake, and chock both front wheels. 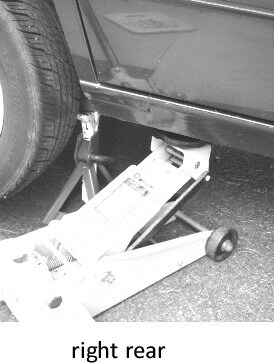 Because the normal car jack couldnt lift high enough, I used a floor jack to lift the left rear of car and inserted a jackstand. I then released the floor jack to use it on the right side, also inserting a jackstand there. Then, I used the stock car jack as backup support for the first jackstand on the left side. Never rely solely on a jack to support the car while youre underneath. 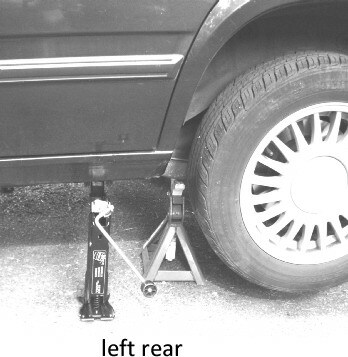 The use of jackstands---and jacks as backups---increases your safety. i) Dremel cordless (10.8 V Lithium Ion Cordless) with 420 cut-off wheel. A Dremel corded tool will also work. 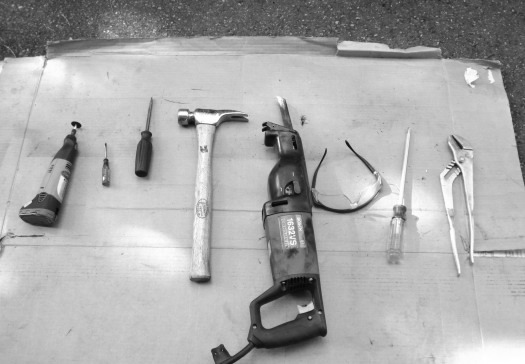 Use these tools to slot the pipe connections so you can pry them apart. ii) Small flat-bladed screwdriver to start prying of female connector off male connection of exhaust pipe. iii) Larger flat-bladed screwdriver to continue prying process. iv) Hammer to drive the flat blades of the screwdrivers into the connection. v) Reciprocating saw with metal cutting blade makes it easy to cut through old pipes for easy removal. vi) Safety glasses. Dont even attempt this job without them! Keeps iron dust, particles, and perhaps even a broken cut-off wheel from hitting your eyes. 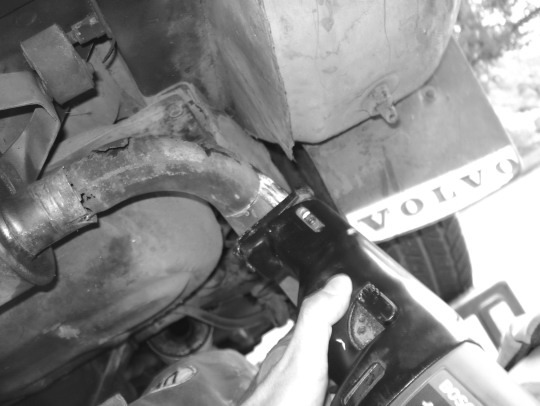 vii) Large screwdriver, which can help in prying rubber hanger off under-chassis hooks that hold the mufflers in place. viii) Large waterpump pliers for closing those pried female connections back in place during installation. ix) Not shown: (a) Soapy water, useful for sliding rubber hanger off those under-chassis hooks, (b) small tack hammer for hammering down edges of female connector during assembly. 4) You only need to remove clamps for a pipe (one end of connection) you are re-using*. 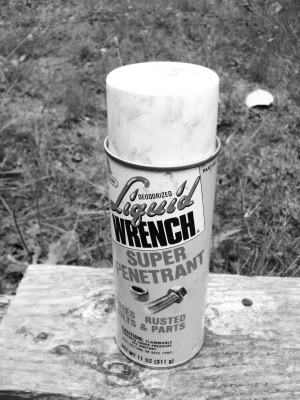 Use penetrating fluid to help loosen the corrosion around the 13-mm (usually) clamp nut. Then, use a long-handled wrench to break the nut free and remove. Either pry the clamp off or slide it along the soon-to-be discarded pipe. *Otherwise, just slice through old pipe with the reciprocating saw (step 9). 5) Note nomenclature on flat face of old clamp where bolt goes through. It is usually labeled R56 or R58. 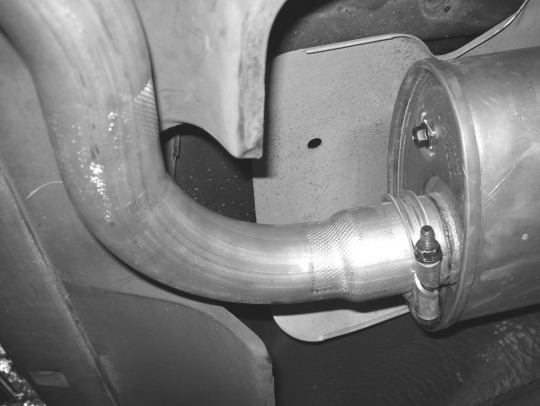 On the 940, R58 is used for the front muffler joint to the pipe of the catalytic converter. I believe all of the other joints use R56, but you should doublecheck me on this. 6) Here, I am initiating the prying of the female connector because the underlying male pipe belonged to a lifetime warranty muffler that was still in good condition. This is just brute force using a flat-bladed screwdriver and hammer. Pry up a little, then use Dremel tool to slot the connection (below). 7) Slotting the female connector (of the pipe to be discarded) with the Dremel tool makes it much easier to peel the connections apart. Be careful that you dont cut into the underlying male pipe. While cutting, you will see bright silver as the cutting wheel cuts into the steel. Once you cut through the female connection, you will be able to see the dark space between the two pipes. The end of the connection is indicated by the narrower diameter of the female pipe (arrow). Normally, all you need are 2 slots about 90-100 degrees apart. (Limited access underneath the car will most likely prevent the slotted cuts being 180 degrees apart. Usually, the factory-made slots are 120 degrees apart---though some are 90 degrees apart--- and make a natural starting place for your cutting slots.) After making slots, pry connection apart with screwdriver blade and hammer. If you are experiencing undue difficulty, make another slot. 8) This photo shows the female connector peeled apart. 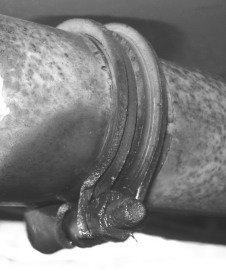 Note that the underlying male connector of this lifetime warranty muffler is in good shape. If the underlying pipe is not in good condition, then replace that piece. 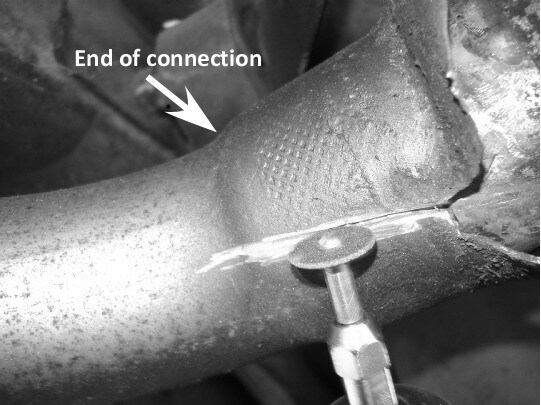 9) For those sections of the exhaust system that you are going to discard (like the corroded, holey under-axle pipe shown in this photo), the reciprocating saw with metal blade makes short work of the cutting process. Be careful not to hit adjacent parts, such as the gas tank. 10) Both mufflers are suspended via rubber hangers onto the chassis. I have found that it is best to lift the rubber off the top (chassis) hook rather than trying to work the bottom (muffler) hook through the rubber hole. If needed, soapy water should help. You may have to use your leg or knee to press up against the muffler so that you can work the rubber off the upper hook. This same technique works for installation. 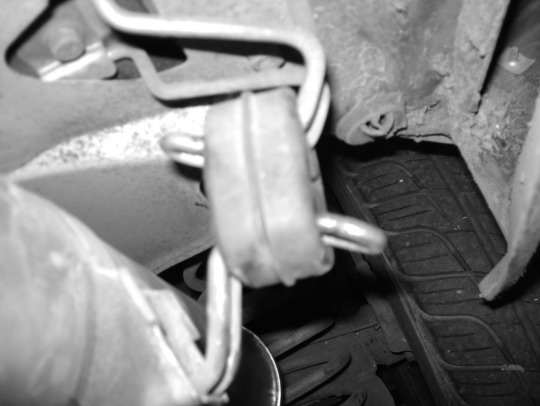 Disassemble the metal bands of the hangers on the old mufflers. Inspect them. Replace parts, if needed. 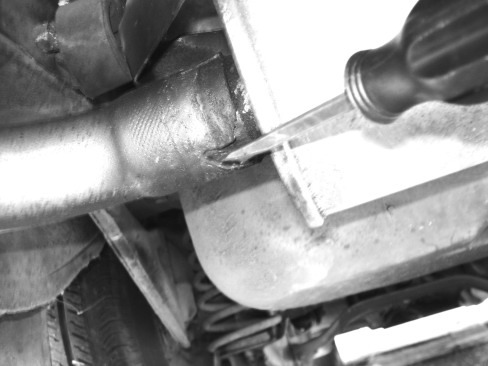 Be sure to measure their locations on the old mufflers and install them on the new mufflers at the same position. This ensures that the rubber hangers will align to the chassis hooks. youve slipped on the clamp before joining the pipes. 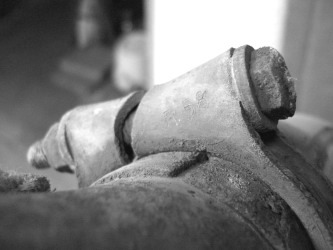 If you forget, you may be swearing up a storm because the pipes can be hard to separate once joined. Set the clamp at about the bottom third or half of the slotted portion of the female connector. As you tighten the clamp, you should see the slot being squeezed, narrowing in size. As you drive, the connections will seal airtight. Congratulations! Youve replaced your exhaust system!